For other uses, see Galaga (disambiguation). Galaga[a], pronounced /ɡælʌɡə/, is a Japanese arcade game developed and published by Namco Japan and by Midway in North America in 1981. It is the sequel to 1979's Galaxian. The gameplay of Galaga puts the player in control of a spacecraft which is situated at the bottom of the screen, with enemy aliens arriving in formation at the beginning of a stage, either trying to destroy, collide with, or capture the spaceship, with the player progressing every time alien forces are vanquished. Galaga introduces new features from its predecessor, Galaxian. Among these are the ability for two player shots to exist on-screen at once rather than one, a "hit/miss ratio" statistic at the end of the game, and a bonus "Challenging Stage" that occurs at Stage 3 and every fourth stage thereafter, in which a series of 40 enemies fly onto and off the screen, 8 at a time, and moving in set patterns without firing at the player's ship or trying to crash into it. When you destroy a group of enemies, you are awarded 1K-3K pts. These stages award a 10K-point bonus if the player manages to destroy every enemy, but otherwise 100 bonus points for every enemy destroyed. Another feature in the game is for enemies to randomly transform and organize into a certain formation, which awards the player bonus points if they manage to successfully destroy all three (1K to 3K points), from levels 4 on, and repeating every 256 levels. Another gameplay feature new to Galaga is the ability for enemies to capture the player's fighter. While the player is in control of just one fighter, a "boss" Galaga (which takes two hits to kill, the first hit will turn it blue) will periodically attempt to capture the fighter using a tractor beam. If successful, the fighter joins the enemy formation as a satellite to the boss Galaga which captured it. The captive fighter becomes an enemy, turns red, and likewise, it can be shot and destroyed, awarding the player 1K points on its destruction. The player can still fire while being captured up to the point their ship "touches" the captor, which could be considered an opportunity to shoot the captor down before it can manage to successfully capture the player. Captive fighters can be freed by destroying the boss Galaga towing it while it is attacking. The freed fighter will then combine with the player's fighter who freed them and form a Dual Fighter, offering doubled firepower but with the disadvantage of a target twice as large. If the player destroys the captor while it is still in formation, the captured fighter will not be rescued, and will instead fly away after a diving run (assuming the player does not destroy it) to appear in the next stage as a satellite for another boss Galaga where it can again be rescued. A very small section in the middle of the Dual Fighter is immune to enemy fire. The default setting for extra lives awards them at scores of 20K, 70K, and every multiple of 70K, though other settings can be used. However, no matter the settings, after turning over at 1,000,000 points, no more extra lives are awarded. Additionally, the 2nd player may have up to 8-digit scores; this is the first video arcade game to have this feature. The high score display, however, maxes out at six digits. Galaga has an exploitable bug that can cause the attackers to randomly stop firing shots at the player. In addition, similar to the Split-Screen Level in Pac-Man, a bug exists in Galaga in which the game "rolls over" from Stage 255 to Stage 0 (256). Depending on the difficulty setting of the machine, this can cause the game to stall, requiring that the machine be reset or power-cycled in order to start a new game. Galaga also contains a bug that allows the player to briefly control the spacecraft during the game's attract mode. Virtual Console: Famicom/NES port released in North America on April 9, 2007 for the Wii, on March 13, 2014 for the Nintendo 3DS and on August 15, 2013 for the Wii U; In Japan, the arcade version released on November 24, 2009 for the Wii while the Famicom/NES port released on May 22, 2013 for the Nintendo 3DS. Nintendo 3DS: As part of the retail title Pac-Man & Galaga Dimensions; Released in Japan on June 23, 2011; North America on July 26, 2011; Europe on August 26, 2011. Maemo 5 (Nokia N900): Free download from Ovi Store available in certain regions only. PlayStation 4, Steam, and Xbox One: released April 20, 2016 as part of the Arcade Game Series. Galaxian and Galaga were bundled together for a Game Boy release as Arcade Classic 3. Galaga included as part of the Namco Museum series of collections across multiple platforms. Galaga is used as a side game during the loading stage of the PlayStation port of Tekken in 1995. This version consisted entirely of challenging stages. In Point Blank 2, there are a few Galaga challenging stages where the player must shoot a certain number of enemies to complete the stage. In 2001, Namco released a "20 Year Reunion / Class of 1981" arcade unit which contained the original Ms. Pac-Man and Galaga games. Some of the original game's bugs are still present in this version, including the ability to stop all enemies from firing at the player. This version added a continue feature, when the player's lives are exhausted, the player can choose to continue or start over. The game was later released as part of the Pac-Man's Arcade Party arcade machine in 2010. Namco began releasing Galaga on mobile platforms in 2004. In celebration of the 25th anniversary of the game, Sprint is also offering their wireless subscribers the chance to start the game in Dual Fighter Mode. Galaga is also one of the bonus arcade games included in the Wii and Nintendo 3DS versions of Pac-Man Party. In 1995, Namco re-released Galaga along with an enhanced remake titled Galaga Arrangement, which features a number of graphical enhancements and gameplay differences from the original. 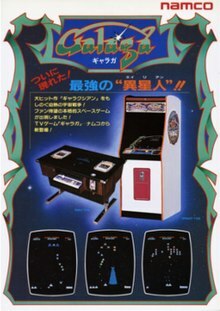 Galaga Arrangement has subsequently been published as part of the Namco Museum compilation on several home video game consoles. Another remake, Galaga: Destination Earth, was released in 1998 for Windows, the PlayStation, and the Game Boy Color. A Galaga Remix game was part of the 2007 Wii compilation Namco Museum Remix and its 2010 follow-up compilation, Namco Museum Megamix, but its gameplay completely unlike that of the original—the Wii Remote is used as a gun, and players must "protect Pac-Man as he rolls through space, and quickly shoot down invading forces before they attack him." Galaga, along with Galaxian, Gaplus, and Galaga '88, was "redesigned and modernized" for an iPhone app compilation called the Galaga 30th Collection, released in commemoration of the event by Namco Bandai. A free-to-play mobile Galaga game based on the anime and manga Space Dandy, was announced under the name Space Galaga. AllGame rated the arcade version 5 out of 5 stars. Famicom Tsūshin scored the Game Boy version of the game a 24 out of 40 upon release. The NES version received a score of 80% from Joystick upon release, and later 8 out of 10 from GameSpy. In 1996, Next Generation listed the arcade version at number 96 in their "Top 100 Games of All Time", citing the innovations it added to the Space Invaders formula, in particular that ships can be captured and rescued and players can gain two simultaneous shots. In an article on MAME-based arcade game emulation, Games magazine's Eric Berlin placed Galaga among his top 7 best holding-up titles from the past, and he described the game as one of the few titles of the era to add new twists to the Space Invaders formula by allowing the aliens to capture your ship. Game Informer ranked it the 19th best video game in 2001. The staff felt that it was still the best shooter of its kind. It has been included among the best video games of all time by various other publications, including Electronic Gaming Monthly (in 1997, 2001 and 2006), G4, GameFAQs (in 2004 and 2009), GameSpy, GameTrailers, IGN, Killer List of Videogames, and Time magazine. The world record highest score for Galaga was set in October 2018 by Armando Gonzalez of Los Angeles, California. Gonzalez scored 17,684,050 points based on Marathon settings. On February 7, 2019, Mike Thompson of New Hampshire achieved a world record high score of 6,679,190 points on the much harder Tournament settings. The Rapid-Fire settings (depression of the fire button causing continuous shooting) world record is held by Jon E. Klinkel of Battle Creek, Michigan, with a score of 3,210,590 points. In 2001, Namco released Ms. Pacman / Galaga Class of 1981 as part of a compilation. The world record highest score for Galaga based on the Fast-Shoot Speed settings (where bullets are fired at a much faster rate than the original fire version) is held by Daniel Rodriguez of Hialeah, Florida, who achieved 4,300,360 points. In 1983, shortly after Galaga was released in the United States, MGM sent a Galaga machine to Matthew Broderick for him to practice prior to shooting the movie WarGames. He practiced for two months and the Galaga arcade unit makes two appearances in the film. In 2007, the ABC TV series Lost included a submarine named Galaga, in honor of the arcade game. Writers of the series would often play the game between writing sessions. In 2009, the Hallmark greeting card company released a Christmas tree ornament shaped like a Galaga arcade machine, complete with sound clips from the game. In the 2013 novel University, set in the 1980s, one segment focuses on a marathon Galaga session, with wheelchair-bound freshman Dwight Manning making a run at the then-existing world record. The TV show Once Upon a Time shows the character Henry Mills playing Galaga in an arcade on episode 15 of season 7, Sisterhood, released on the 30th of March, 2018. Researchers at North Carolina State University, having discovered the remains of a prehistoric shark, named the species Galagadon nordquistae based on Galaga due to the resemblance of the shark's teeth to the game's enemy spacecraft. Galaga appeared in the following movies: WarGames (1983), The Karate Kid (1984), Planes, Trains and Automobiles (1987), and Pixels (2015) as the first game that attacks. Galaga appeared briefly in 2012's The Avengers. Upon entering S.H.I.E.L.D. 's Helicarrier, Tony Stark catches an agent playing Galaga and remarks, "That man is playing Galaga. Thought we wouldn't notice, but we did." After the Avengers' team meeting, the agent returns to his game. The Galaga boss is an item in Super Smash Bros. for Nintendo 3DS and Wii U. Players can throw the boss at enemies, and the boss will then proceed to use its tractor beam to lift the opponents away. The Galaga boss returns as an item in Super Smash Bros. Ultimate. A medley of the music from Galaga also appears in the game, arranged by composer Yusuke Takahama. An animated television series entitled Galaga Chronicles is planned. ^ Japanese: ギャラガ, Hepburn: Gyaraga? ^ "Computer Archeology analysis of the Galaga no-fire bug". Retrieved 2010-04-20. ^ "Video Shorts: Galaga". Nintendo Power. Vol.2, Pg.84. September/October 1988. ^ "Galaga: TEKKEN Edition - Android Apps on Google Play". Archived from the original on 2015-05-18. Retrieved 2015-04-30. ^ "[ OVI Store .. sort of ] Pacman & Galaga". ^ "Galaga". Namco Games. Archived from the original on 2008-12-05. Retrieved 2009-05-01. ^ "2009 News Releases". Sprint. Retrieved 2009-05-01. ^ "Jesse David Hollington, "Namco releases Galaga 30th Anniversary Collection"". Ilounge.com. 2011-06-09. ^ "Galaga 30th Anniversary Collection information from Apple iTunes". Itunes.apple.com. 2011-06-09. ^ "Galaga". Rovi Corporation. Archived from the original on 10 December 2014. ^ NEW GAMES CROSS REVIEW: ギャラガ&ギャラクシアン. Weekly Famicom Tsūshin. No.344. Pg.32. 21 July 1995. ^ "Chase HQ" (JPG). Download.abandonware.org. Retrieved 2016-03-11. ^ "Classic Review Archive - Galaga". Archived from the original on 7 October 2008. ^ "Top 100 Games of All Time". Next Generation. No. 21. Imagine Media. September 1996. p. 38. ^ Berlin, Eric. "Rediscover the Classics - As Good As Ever". Games. Issue 158 (Vol 24, #1). Pg.11. February 2000. ^ "GameSpy's Top 50 Arcade Games of All-Time". GameSpy. IGN. February 25, 2011. Retrieved November 19, 2013. ^ "IGN's Top 100 Games of All Time". IGN. 2003. Archived from the original on 2014-12-07. Retrieved 2014-12-17. ^ "The Top Coin-Operated Videogames of All Time - The International Arcade Museum". ^ "Best Video Games | Best Video Games of ALL-TIME | TIME.com". Techland.time.com. 2012-11-15. Retrieved 2016-03-11. ^ Gonzalez, Armando. "Galaga Marathon Settings High Score". kotaku.com.au. Retrieved 2018-10-26. ^ Thompson, Mike. "Galaga Tournament Settings High Score". twingalaxies.com. Retrieved 2019-02-07. ^ Klinkel, Jon E. "Galaga Rapid-Fire Settings High Score". twingalaxies.com. Retrieved 2017-01-16. ^ Rodriguez, Daniel. "Ms. Pac-Man / Galaga: Class of 1981 [Galaga] Fast-Fire Settings High Score". twingalaxies.com. Retrieved 2017-01-16. ^ Grisham, John William (2013). University. Aloha Lounge Press. ISBN 0-9889-6040-0. ^ Holt, Kris (January 22, 2019). "Scientists name ancient shark species after arcade classic 'Galaga'". Engadget. Retrieved January 22, 2019. ^ Gates, Terry; Gorscak, Eric; Makovicky, Peter (January 21, 2019). "New sharks and other chondrichthyans from the latest Maastrichtian (Late Cretaceous) of North America". Journal of Paleontology. doi:10.1017/jpa.2018.92. Retrieved January 22, 2019. ^ "Classic video game characters unite via film 'Pixels'". Philstar. July 23, 2014. Retrieved July 23, 2014. ^ Clark, Cody (24 May 2012). "Don't go tugging on Iron Man's, um, whatever". Daily Herald. Provo, Utah: Lee Enterprises. ^ Haring, Bruce (August 23, 2018). "'Galaga Chronicles' Arcade Game Saga Adds Roberto Orci, ShadowMachine". Deadline. Retrieved August 24, 2018. This page was last edited on 15 April 2019, at 07:45 (UTC).